I finished the boat. 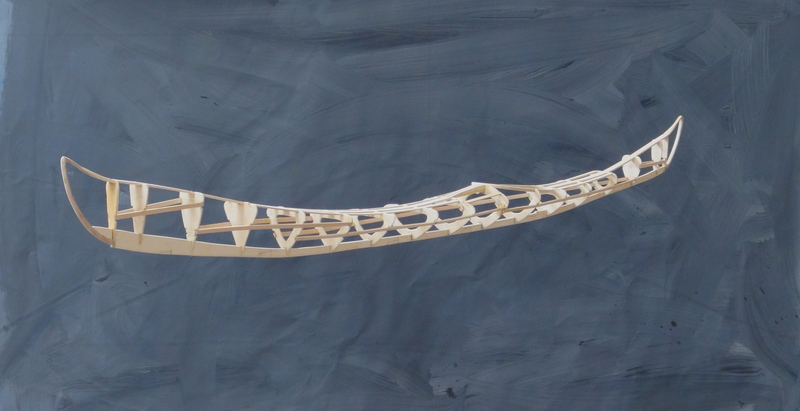 Or at least the model — 65 inches long. 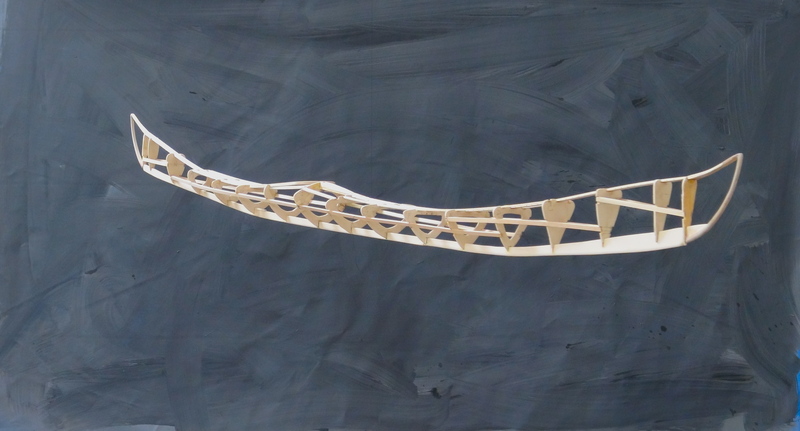 Crafted of 1/8″ birch plywood and basswood and glue. I had intended to cover it. I tried several tests with heat-shrink dacron. I would have had to construct the vessel differently to allow that to work. Then I thought of veneer. Either large pieces or thin strips. I abandoned that too. As it happened the more I looked at the skeleton structure of the vessel the more liked it. I took photos all the way through construction. I want to make a slide show of that, quickly showing the fabrication. I am building a boat. Not a fine wooden skiff for sailing the marina. Nor a ketch to circle the world. Mine: a vessel for the mystic journey. Thin, sleek and I hope beautiful. Yet useless, at least as a vessel to navigate water. Why, you might ask? I have to blame the muses. The idea surfaced in 1986 — long, over 18 feet and made of cedar strip. The complications, craftsmanship and time required all undermined its creation. Yet every few years the idea resurfaces. Until this spring. Having surfaced again, I gave in. 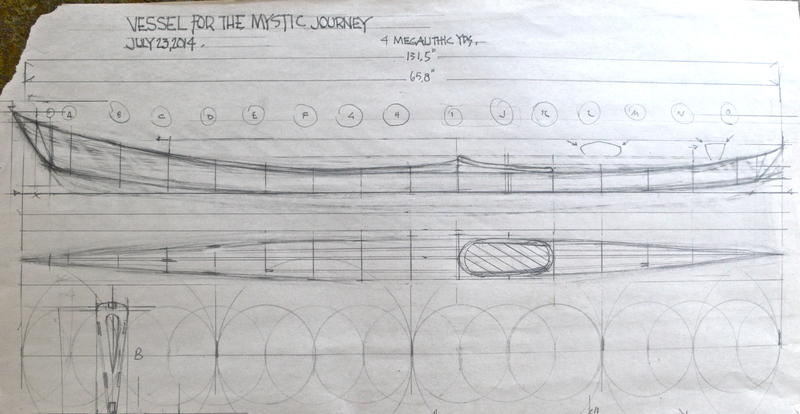 Below the drawing you can see the four large circles and then intersecting smaller ones that dictate the placement of the ribs of the boat. This is the last of thewhispered video clips. The question, in case it starts after that, is What hinders creative authenticity? I’ve got one or two more of these thewhispered.com interview videos. Then I’ll have a few paintings from Provence this year. Another short video clip from the whispered interview. Two minutes. For some reason the first few seconds get deleted from the video, where the question is posed. The question here was, Is mastery of any sort a process to creative authenticity? Another short clip from the whispered interview. This one, three minutes. Sorry about the video not being in the last post. The preview looked fine, then the video disappeared when I published the post. Apparently I’m not the first person to have this happen looking at the help page. This is another short clip from the whispered interview. A few months ago the photographer Jakob de Boer, from thewhispered.com, asked me to answer some questions on authenticity. I wrote a book Creative Authenticity and he felt the ideas there were relevant to his website on mastery. We spoke, and he recorded, the conversation on Skype. He asked me several questions. I’ll post them all over the next few days. Each video is about a minute long. A lot of representational painters describe themselves as painters of light. Wasn’t that Thomas Kincade’s logline? But let’s be honest, even though we know what they mean, the idea is a misnomer. All representational painters paint the effect of light. Otherwise what could they be painting? But James Turrell actually does paint, or perhaps more correctly, although I’m not sure, sculpts with light. Literally. Turrell’s masterwork will be Roden Crater. I wanted to visit it in 1988. But it cost $1000 and I didn’t have it. Whatever it costs now, and it’s a lot, I still can’t afford it. He has turned an extinct volcanic cone in the desert north of Flagstaff, Arizona, into a spiritual/astronomical laboratory/sculpture that may go down as the most important artwork of the Twentieth century (hopefully beating out Duchamp’s Fountain, which I love by the way, but come on). 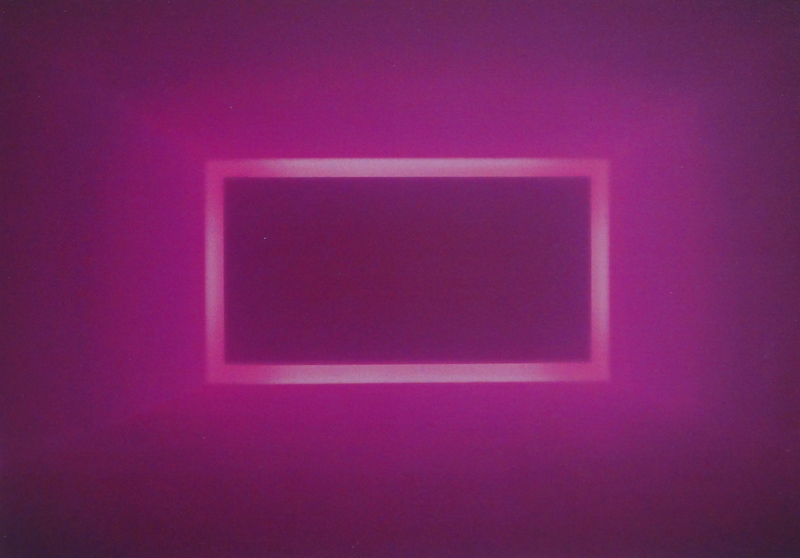 The Los Angeles County Museum of Art (LACMA) currently exhibits a number of Turrell’s paintings. I’ll call them paintings because when you first walk into the room, they look like paintings. Sort of. A large rectangle of light greets you, just like a painting would. But the surface glows and shifts with very subtle gradations of color. You get closer, staring at the image, trying to understand how and what makes the painting do what it does. But at LACMA you can only get so close before a guard tells you to step back. I’m not sure how I would have understood and appreciated the show if I had not had the opportunity fifteen years ago to visit a Turrell piece in an insurance company’s collection in Des Moines. I was with an artist friend and the woman who oversaw the collection. We entered a large dark room with only the one Turrell painting in it — a rectangle of shimmering light twenty feet by ten feet. Only here I could get as close as I liked. The surface became more lively with each step closer. The light seemed more tangible, and more ethereal at the same time. Nothing I knew of painting or paint could do this. One step closer, perhaps two feet from the “surface” I had been looking at, and the surface dissolved and I felt myself lurch forward mentally into deep space. A large perfectly-crafted smooth white bubble perhaps twenty feet deep existed behind the frame. Light evenly distributed from in behind the frame lit the bubble. Turrell crafted, sculpted, a scintillating skin of false surface. What was interesting, even after I knew how he did it, after I understood the “trick”, if I stepped back the “surface” would reconfigure and I could again step forward to the point where again I was released from the illusionary surface into deep space. Turrell’s exhibition at LACMA has several variations of that theme. One you can actually walk into. The interior of the piece and the light around the exterior of the frame both shift in color and intensity so the effect of the skin of the surface and the frame mutate constantly before you. One small variation, the shape and size of a 50’s television screen and with no guards in sight, allows you to get up close and pass your hand through the surface and better experience what he is doing. A huge scale model of Roden Crater fills the last room of the exhibition. I’m not sure when Turrell will finish it. Or how I’m going to get to see it. But I don’t think anything else will hold a candle to it.